Tea tree oil has natural antiseptic qualities that make it a potent treatment for a variety of ailments. It is especially helpful in treating a variety of infectious ailments, including insect bites, acne, ringworm, canker sores, athlete's foot, and toenail fungus. A must-have item to keep readily on hand at home and absolutely essential for your first aid kit or holistic health kit. Most nail infections derive from a fungus called Trychphyton Rubrum, Tea tree oil is very effective in the treatment of these infections. There is an element in tea tree oil called Melaleuca Alternifloria, this directly attacks Rubrum fungus. Nail fungus is a hideous condition to deal with. It is not pretty and can be smelly! It certainly can be challenging to treat. As a result, people tend to hide their infected toes from view due to embarrassment. Some will attempt to camouflage their infected yellow nails by painting their toenails. Ladies, nail polish is not your friend! Sure it hides the ugly yellow from view but it also traps the infection and promotes its growth. 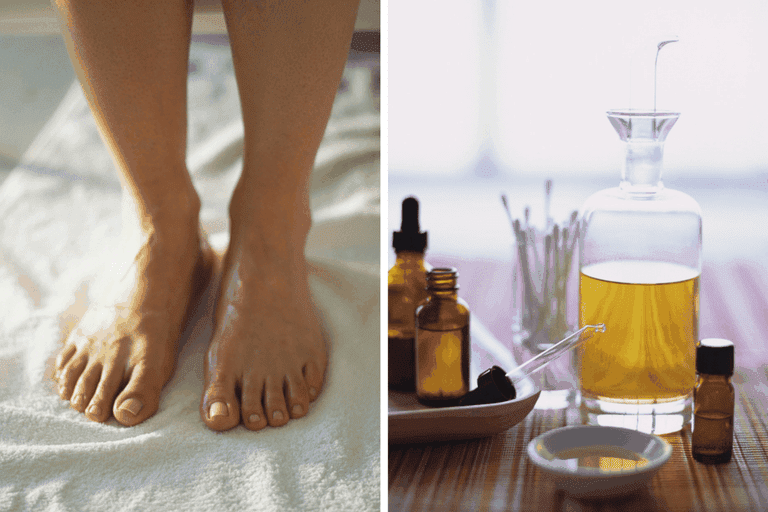 Tea tree oil meets the challenge of combating and clearing nail fungus with flying colors. Apply one or two drops of tea tree oil directly to infected finger and toenails three times daily is recommended. Don't give up. Be consistent with your applications and in a few days, you should begin seeing results. Keep up the applications for as many weeks as needed. Results will be slower if you don't allow ventilation. It is important to give your feet air time. If you are in the habit of wearing socks to bed... well, just don't! Direct application of tea tree where contact is made to the skin can be problematic. It can sting a bit. One way to tolerate treatment is to try soaking your feet in treated water or application of treated lotion or powder. Add the three ingredients listed above (vinegar, tea tree, and your choice of secondary essential oil) to a basin filled with warm water. The water should be wrist or ankle deep. Soak your hand or foot for fifteen to twenty minutes. Pour vinegar into a dark glass bottle. Add the essential oils and shake well. Then add the water and shake again. Swab affected areas with cotton 3 times daily. Shake well prior to application for each use to disperse the oils. Put corn flour or talc into a small plastic bag. Add the essential oils. Tie or zip close the bag securely and let sit for 24 hours allowing the oils to spread through base. Shake well before using first time. Keep tea tree oil away from your eyes. So if you have applied lotion that has tea tree oil in it don't be rubbing your eyes. Also, if you have added tea tree oil to your shampoo, be sure to rinse well and avoid getting the shampoo into your eyes. Source: Tea tree recipes adapted from essential oil recipes shared by holistic healing member "Healloop" in the former About.com Holistic Healing forum.